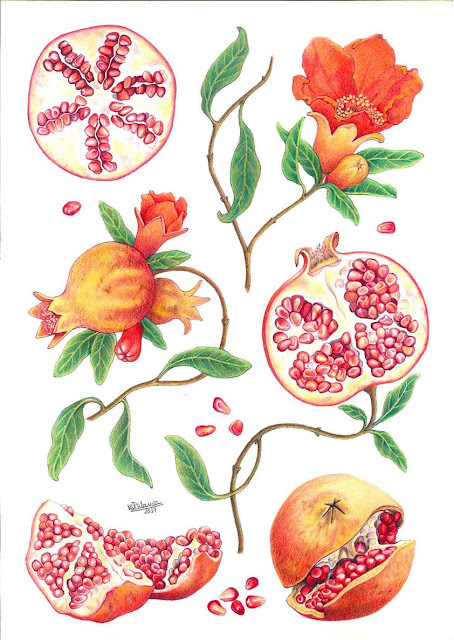 Pomegranate is a bushy, deciduous tree or shrub, to 5 m high, extremely long-lived. Flowers orange-red; sepals triangular; petals obovate, crimped on margin. Flowers are characterized by the thick, tubular, red calyx having 5 to 8 sepals forming a vase from which emerge the red petals enclosing the numerous stamens. The fruit has a tough, leathery skin or rind, basically yellow more or less overlaid with light or deep pink or rich red.